Inventory We are a resale marketplace, not a box office or venue. Ticket prices may exceed face value. This site is not owned by Goodman Theater . The Goodman Theatre in Chicago Illinois was opened in 1922 and has a seating capacity of 1,525. It was closed for nearly twenty years leading up to the year 2000, when the building was gutted and completely redone into what you see today. The theatre features modern architecture and amenities but retains a regal stature with marble countertops, wooden floors and walls, and intricate lighting. The theatre hosts Broadway Events, Comedy Acts, and concerts. The exterior of the building remains as it was originally because the building contract forbids the changing of a city landmark. 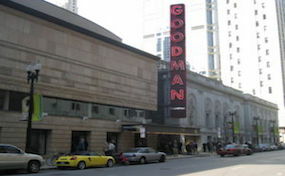 The Goodman Theatre Box Office is located at 170 N. Dearborn St. Chicago, IL, Illinois. Goodman.Theatre-Chicago.com is not affiliated with any primary box office or supplier. We are a privately owned and operated business specializing in sales in the secondary market. To buy tickets for any Goodman Theatre events in Chicago simply click on the event of interest or call our operators at anytime.